A dry autumn and summer in Jersey has led an island utility to begin the process of turning seawater into drinking water. Island reservoirs are currently 46% full - compared to 71% at the same time in 2017. Jersey Water said it was preparing its desalination plant because little rain was forecast for the "foreseeable future". It will be the first time the unit has converted seawater in seven years. 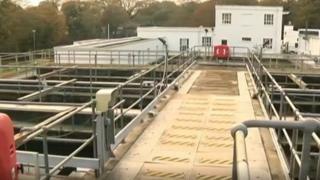 Jersey Water supplies 38,000 homes and businesses across the island. Chief executive Helier Smith said: "We need to ensure resources are able to recover over the winter to provide sufficient reserves for next spring and summer." "We are urging Islanders to use water wisely in order to help reduce waste and preserve water resources," he added. The last time dry weather forced the island to make drinking water from the sea was in October 2011. Between May and October 2018, Jersey had 227mm of rainfall - less than half the 485mm that fell over the same period in 2017. Despite recent wet weather Jersey Met Office has forecast little rain in the coming weeks. Forecaster John Searson said: "It will remain drier than average and certainly the beginning of December looks very dry."